Boasting product-of-the-year six years running, Patton SmartNode™ scores ninth major industry award as INTERNET TELEPHONY® magazine recognizes the SN5400 Enterprise Session Border Router for outstanding innovation. 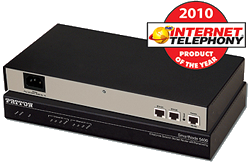 GAITHERSBURG, MD: PATTON announced today that the Enterprise Session Border Router (ESBR) claimed Product of the Year for 2010, maintaining a six-year winning streak for the brand. Swiss-engineered and US-manufactured, Patton’s powerful session border controller (SBC) provides secure connectivity between iPBX systems and Internet Telephony Service Provider (ITSPs) with any-to-any SIP and H.323 protocol mediation. Installed on customer premises, the SN5400 ESBR resolves the security, interoperability, and WAN optimization challenges businesses face when implementing SIP trunking solutions (see NETWORKWORLD: Top 5 SIP-Trunking Gotchas). By transcoding all industry-standard voice CODECs, the SN5400 optimizes WAN utilization while ensuring toll-quality voice over the corporate LAN. WAN optimization accelerates performance of WAN applications throughout the enterprise, including file downloads, video-conferencing, and cloud-based services. Patton’s SBC lowers the total cost of implementing SIP-trunking by including rich-featured IP routing, VoIP-VPN security and encryption, voice-and-data survivability, least-cost call routing, and QoS—all without added licensing or support fees. For in-depth analysis of SIP trunking, VoIP-VPN security, and VoIP QoS, visit Patton’s white-paper library. Read TMC’s interview with Burt Patton covering the future of VoIP and unified communications in next month’s InfoTECH Spotlight magazine. Patton’s most recent awards include 2010 NGN Leadership for the RocketLink™ 3200 EFM G.SHDSL Modem and 2009 Product of the Year for the SmartNode™ 4400 IpChannelBank™. Last week Patton announced SmartNode is IBM-certified for interoperability with Lotus Sametime Unified Communications software. Patton sponsors TMCnet’s VoIP Routers Global Online Community, VoIP Gateways ChannelEthernet Extender Channel. Also on TMCnet, visit Patton’s VoIP Routers Global Online Community, VoIP Gateways Channel and Ethernet Extender Channel.